Wow. There's an old saying: "Power Corrupts". It seems with Mike Duffy, he's turning out to be the proof of just how corrupt things are within the Conservative Party of Canada. When CBC turns up an e-mail where Duffy is basically demanding to be made a cabinet minister. Not only does it speak to a sense of entitlement on Duffy's part, but it also gives us a little window of insight into some of the techniques that have developed to exploit the taxpayer dollar to the benefit of the CPC since Harper came to power. Six months after he was appointed to the Senate, Mike Duffy was in consultations with Conservatives about an expanded role in the party and increased compensation, including his own suggestion he be named a minister without portfolio to get a car and staff, according to an email exchange obtained by CBC News. Seriously. Just consider the sense of entitlement that this implies. Duffy thinks that he doing so much "good for the party" that he deserves a political appointment to the cabinet table? Interesting. It says a great deal about the atmosphere the party under Harper. Marjory LeBreton, speaking to reporters in the Senate foyer, said, "It's ridiculous. The idea that the prime minister or anyone would pass over elected members of the House of Commons and name Mike Duffy as a minister? It's so ridiculous it's not even funny. It's totally bizarre. Who knows, who knows, but when I read it, when I read it — I don't know who the recipient of the email was — but when I read it I went, like, there isn't a chance of a snowball in hell of this ever happening, and I never spoke to him about it." However, as soon as Harper formed government in 2006 he advised the Governor General to appoint Montreal businessman and Conservative fundraiser Michael Fortier to the Senate, and immediately put him in cabinet as public works minister. Harper had no Conservative MPs elected in Montreal, and needed a Montreal voice in his cabinet. Fortier promised to run in the next election in 2008, but he was defeated and was not reappointed to the Senate. LeBreton herself was named from the Senate as a minister of state for seniors for a few years by Harper, although as government Senate leader she is automatically a cabinet member. I do note that the party adviser that Duffy was corresponding with seems to be cool to the ideas, the responses are not rooted in whether the path Duffy was proposing was right or wrong, but rather they were based on whether there was a cost to the party if Duffy got caught. Remember, the party leader sets the tone. For Mr. Duffy to believe that he could make such a suggestion and get away with it, he had to have gotten the idea from somewhere. I'm sure that Duffy very much believes that he is entitled to his entitlements, but the idea that double billing the taxpayer, or using taxpayer resources to fund what is obviously going to be partisan activities says a great deal. At the end of the day, this goes back to Mr. Harper's desk - directly. This will be a somewhat lengthy post. In part, because I find the space I am about to discuss multi-faceted, and the discussion around each facet of the conversation is non-trivial. The involvement of mental health professionals in the process of Gender Transition (I will use the term "transition" from here on in) is complex and the subject of many strongly-held opinions within the transgender community. This essay will be my attempt to lay out for readers my perspective on things. Readers should note that these are my opinions today. Time, evidence and rational counterpoint may well convince me to revise my position. This broke last night, but I don't do a lot of writing late at night. It seems that Harper has found his way to silence this issue for the time being. The minute that it goes to the RCMP - regardless of what the outcome is - there will be a wall of silence about it on the basis of "not wanting to interfere" with an ongoing investigation. I do not expect that this will produce any kind of charges against Mike Duffy. At most, I expect it to produce a statement from the RCMP in a couple of months to the effect of "we investigated, but there is insufficient evidence to lay criminal charges". It has long been my opinion that Duffy hasn't engaged in criminal behaviour per se (although his dipping into the Senate money trough should be criminal). Duffy has engaged in something that might be borderline fraud - but it's definitely in a grey zone. What he has engaged in is telling Canadians a different story every time we turn around. Duffy's transgressions are moral and ethical in nature, and speak to a lack of clear-headedness that we demand of parliamentarians in both chambers. The point here is that were Duffy an "honourable" man in this regard, he would have made right a long time ago. More recently, he should have resigned from his Senate seat. Unfortunately, with the current Conservative government, it is unlikely that we will see any such thing as a resignation in this matter. Harper has shown that he will go to great lengths to protect people that he sees as political assets. Having recently lost Penashue to a by-election, expect Harper to entrench his efforts to secure his grip on power. More or less as I had anticipated, after failing entirely to characterize Justin Trudeau as "in over his head", the Harper Conservatives are turning to their next line of attack. This time, the angle is to go after Justin's father and his legacy, thereby "blackening" the Trudeau name. The writer of the column on the National Post website is positively drooling over the content of the coming "blackened biography" - claiming that the biographies that have come before are all pandering to the "legend" of Pierre Trudeau. Of course, that doesn't surprise me. The "Law-and-Order-Except-For-Conservatives" Con$ have always despised things that Pierre Trudeau did - especially the Charter of Rights and Freedoms which severely limits the government's ability to attack its own citizens. It will be a classic "guilt-by-association" attack. I am sure that the Conservative attack ads for the next few months will contain little bits about various things that Pierre Trudeau did, and will try to imply that Justin will do the same things. Whatever is in those ads will be spun and distorted beyond any recognizable version of reality. Or they may just attack the elder (and deceased) Trudeau viciously and hope that it is enough to damage the Liberals both as a party and Justin Trudeau as a leader. It is as predictable as it is childish, as mean-spirited as it is ludicrous. Canadians are tired of the constant political character assassination of the Conservatives. At long last they are finally awakening to the reality that Harper is nothing more than a schoolyard bully who will do anything he can dream up to maintain his grip on power. Kindly do us the favour of at least remembering to tell a lie that can't be checked up on. Unlike the logically inconsistent pablum you spewed in Peru yesterday. As the good writers at the Hill Times point out, there's more holes in Harper's account of the Senate Expenses Scandal than a block of Swiss Cheese. Mr. Harper’s communications director, Andrew MacDougall, did not reply to an email from The Hill Timeson Thursday noting, with a question mark, that Mr. Harper should have first learned about the payment on Tuesday, May 14, when Mr. Fife asked about it prior to his report. Seriously? You have to know that things have gotten out of control when Harper hasn't got a consistent story to tell. Of course, logical inconsistency is the hallmark of lying when caught flat-footed. Prime Minister Stephen Harper's government deploys a vast early-warning communications system to warn of potential problems on the horizon. But Harper insisted Wednesday that he learned about his right-hand man bailing out an embattled Conservative senator in much the same way as other Canadians did: by seeing it on the news. As the Canadian Press article cited earlier in this article points out, Harper spends enormous amounts of money on monitoring and picking out problems. How the heck does something as big as Duffy's abuse of the Senate expenses system not make it onto that radar? The answer is that given the Harper penchant for micromanagement and obsessiveness about "the message" that borders on paranoia, the issue had to have been visible. The only reason it would have been invisible would be that Harper and his advisors have some rather enormous blind spots where an abuse is happening that just happens to be to their partisan advantage. Late yesterday, the Federal Court handed down its ruling on the 2011 Robocall Voter Suppression tactics that played out in several ridings. Electoral fraud occurred during the last federal election, a federal court judge ruled on Thursday, but there is no proof that it affected the outcomes in six ridings at issue, so the elections will not be overturned. While I understand that the judge is ruling in essence that the degree of fraud that took place in 2011 wasn't sufficient to justify overturning the results of the election in those ridings, I have to disagree with his conclusions. First, I think that the ruling overlooks the consequences of voter suppression tactics for Canada's democracy. Fundamentally, it calls into question the validity of the results of the election not just in the ridings where these games were played, but across the country. Fraud, no matter the degree, is an explicit and intentional abuse of the electoral system itself. To prevaricate about "the degree" to which a party engaged in fraud during an election is basically giving the party in question a license to continue using those tactics. This calls into question the validity of any future elections with that party involved. Second, the awareness that fraud took place in the last election tells those who vote against that party that their votes will be marginalized even further. That is a guaranteed way to encourage more voters to simply stay at home - mostly on the basis of "why bother - it's all rigged anyhow". I cannot blame them when a years-long court battle over known electoral fraud and misdirection ends up with a ruling that is a "split down the middle". The evidence points to “a concerted campaign by persons who had access to a database of voter information maintained by a political party,” Mosley writes, but says there was no allegation that any of the candidates in the six ridings were responsible for the campaign. Frankly, I don't give a damn whether any of the candidates started the campaign of voter suppression or not. The fact that the party obviously provided access to their database of voter information is enough in my opinion to call the entire thing into question. Corruption is corruption. I don't care if it starts with the individual candidate or some committee in the party campaign war room. Fraud at either end is still fraud. The guilty party should be held accountable for its actions. More to the point, Canadians have a right to expect that their elections are free and fair. Attempting to persuade voters of the platforms of various parties and candidates is fair ball. Attempting to discourage or outright prevent voters from voting is NOT. “In reaching this conclusion, I make no finding that the Conservative Party of Canada or any CPC candidates or RMG and RackNine Inc., were directly involved in any campaign to mislead voters,” he ruled. Whether the judge realizes it or not, he has essentially given the green light to further voter fraud next election. What he has said boils down to a rather juvenile "It doesn't matter what you do, just don't get caught". I've heard teenagers use this kind of logic to justify some pretty destructive acts ... and then they get caught. There should be enormous consequences for this kind of violation for all parties involved. If the Conservatives provided access to their CIMS database for this purpose, they should be held accountable. PERIOD. I don't care if it was the party which did it "officially" or if some agent of the party did it "under the table" - it doesn't matter. If the party hasn't got adequate access controls on their database, they need to fix that; if they don't have adequate controls over who gets access to that data, that's their problem too. Ultimately, the party has fought tooth-and-nail against this, meanwhile it's been painfully clear that one of their operatives decided it would be a good idea. The party - and its leadership - set the tone which led someone to think that electoral fraud was acceptable behaviour. It should be held accountable. If you can nail it down to the individuals who perpetrated this, so much the better - hold them to the fire as well. The courts have dropped the ball on this one. In a related note, I would point out that the recent Alberta election had the Wildrose Party abusing the robocall mechanism as part of their campaign. At least they are being held accountable for this. Granted, WRP hasn't been accused of electoral fraud here. When it comes to the idea of rehabilitating our country's Senate, there are a few schools of thought out there. We have Mulcair pushing the line of abolition - get rid of the thing entirely. I can appreciate the visceral emotional response to the recent events which have landed several senators in hot water. That said, I think that abolition would be a foolish approach to take. Of all things, the Senate has demonstrated repeatedly its value in holding back some of the worst excesses of Harper's legislative agenda. When it is not being stacked with partisan appointments by the Prime Minister, the Senate serves a useful purpose in cross-checking the legislative activities of a House of Commons which is often driven by the whims of the voters or worse, by the ideological affiliations of the MPs. The next approach open to reforming the Senate is a combination of legislation and policy rules governing the Senate. Harper has tabled several very flawed pieces of legislation which are intended to "reform" the Senate since 2006. None of these have been passed into law. In my opinion, there is an enormous problem with using legislation to modify the ground rules of the Senate. The first is in fact Harper's own actions with respect to fixed election dates. He brought in a piece of legislation that (in theory) dictated that Canada would have elections on a 4 year calendar much like the United States does. Then he turned around and dissolved parliament partway through that 4 year mandate, effectively rendering his own law absolutely irrelevant. The first problem with legislative approaches like this is that they are a layer of legislation that rests on top of the foundation of the Constitution documents. While drawing more detailed boundaries in law than those provided by the Constitution has a certain validity, the problem is that the arbitrary legislative boundaries seldom contain sufficient penalties to dissuade a politician from breaking them if it suits their political goals. The first attempt to legislate changes in the Senate came at the end of 2006, with the government tabling Bill C-43, with a sister bill in the Senate, Bill S-4. It got partway through the Second Reading process, but died on the table when Harper prorogued parliament for the first time in September, 2007. An all but identical bill was then tabled by the Harper Government in November 2007 as Bill C-20, with a sister Bill C-19. So, what happened to Bill C-20? Good question. It was referred to committee in advance of second reading in March of 2008, and was discussed in committee through to June of 2008. It died on the order table when Harper called a snap election in September 2008. During the 40th Parliament (elected in October 2008), the government tabled Bills S-7 and C-10. Neither of these bills progressed beyond first reading before Harper's government fell on a non-confidence vote in March 2011. Since winning a majority in the 2011 election, Harper has not pursued the matter of Senate reform via legislation, although the Conservative Party has repeatedly argued that the failure to reform the Senate rests on the opposition parties' shoulders "because they wouldn't let the legislation pass". The lack of action on this front by Harper since winning a majority makes me believe that he was using the prior legislation while he had a minority government as a political club, rather than as part of an agenda of actually trying to make meaningful changes. The legislation that Harper had put forward in the 39th and 40th parliaments attempted to enact two kinds of changes. First, Bills C-20 and C-43 attempted to enact an electoral process for the selection of Senators. Their sister bills attempted to create a regime where Senators could only sit for a maximum of eight years. The obvious problem with the electoral process is that there was absolutely nothing in the legislation which bound either the Prime Minister or the Governor General in terms of actually appointing from the list of "selected" candidates. In other words, at the end of the day, the choice for those appointments remains firmly in the hands of the Prime Minister and if the sitting Prime Minister doesn't like any of the candidates chosen by the electorate, well, there's nothing stopping them from ignoring the list entirely. A weakness that renders the entire process of "electing" a senator as meaningful as Harper's "fixed election dates" law. The term limits bills attempted to amend the Constitution Acts directly. While not necessarily invalid, it starts to walk a very fine line, especially where the division of powers between federal and provincial responsibilities is concerned. 44. Subject to sections 41 and 42, Parliament may exclusively make laws amend- ing the Constitution of Canada in relation to the executive government of Canada or the Senate and House of Commons. However, because it refers back to sections 41 and 42, any such amendment appears to be subject to provincial consent before it would come into force. In other words, ultimately, any substantive changes to the Senate and its operations ultimately has to be reflected in the Constitution Act, and is subject to the amending formula described therein. Harper's approach has been to dance around the issue of actually amending the Constitution presumably because he doesn't believe that he can build a coalition of agreement with the provinces. The net result has been a legislative approach which is at best window dressing. Personally, I have no objection to the Senate as a legislative body. In fact, I believe that it can serve a very valuable purpose in our government. That said, it is going to take leadership and courage for any political leader to be willing to open the door to actually making material change to the Senate. Brian Mulroney tried to make amendments to the Constitution and failed miserably because of the flaws seen in his proposals. I imagine that it would be all the more difficult to amend the Constitution with respect to the Senate simply because there are many different views of what could be done. As Harper has demonstrated, legislative window dressing is meaningless unless there are significant consequences for the politician who chooses to violate them. I cannot emphasize enough that the current corruption scandal running around the Senate is only the tip of the iceberg. This morning, we find that CBC is reporting on a bunch of Harper appointees who are making donations to the Conservative Party. Dozens of people appointed to plum patronage jobs have been donating to the Conservative party, despite government rules that forbid it. A Canadian Press investigation found as many as one of every five chairpersons on the Employment Insurance Boards of Referees gave money to political parties, riding associations and election candidates while they served on the tribunal. All but one of the dozens of donations went to Conservatives, Election Canada records show. Once again, the crooks in question are busy denying that they know anything. Donations made prior to chairpersons being named to the EI referees boards, or after their terms end, are allowed under government rules. A number of the boards' chairpersons made political donations before their appointments, with the lion's share going to Conservatives. Eleven chairpersons confirmed making donations. Others did not return phone calls. One appointee refused to confirm or deny her donation. There seemed to be confusion around the no-donation rule. None of the chairpersons seemed aware of any restrictions against donating, and some insisted they had every right to give money to a political party. The government appointed John Buddy Wiens of Morden, Man., as a chairman of the EI referees board for the Winnipeg district in April 2008. Elections Canada records show Wiens made three donations — totalling $1,500 — to the Portage-Lisgar Conservative riding association in 2009, 2010 and 2011. In a telephone interview, Wiens confirmed he made the donations, but said no one told him it was against the rules. He said he did not recall reading the section of the EI referees boards' handbook about political activities. "No, I'm sorry. You got me," Wiens said. "I'm totally by surprise." The standard excuse "I didn't know". Perhaps in this case, it is a lack of education on the part of these people. However, in the world of politics, this is still corrupt and represents a lack of appropriate cross checks in the CPC donation system. It suggests that being corrupt in the Harper Government is fine, as long as you don't get caught. Spin...pure spin. Any politician who would dare claim that the public consequences of being caught with your hands in the public cookie jar represent some kind of ethical high bar is an idiot who is trying to bury the story. Given the constantly changing story related to Duffy's expenses since January, and the attempts by the PMO to back Duffy up with political support, it implies that the current round of resignations are the result of being cornered, not a result of acting on this supposed ethical "high bar"
Coming from an MP who stated that she felt her job would be to "support the Prime Minister in whatever way he decides" during the by-election campaign, this doesn't come as a big surprise. However, it also speaks to the incredible blind spot that the Conservatives have with respect to what it means to govern ethically. I'm not saying that you expect everything to be absolutely perfect, but rather that when corruption emerges, you act decisively to deal with it. What we have seen has been talking points, spin and prevarication instead. Decisive action has taken place only when the political impact is becoming so obvious that Harper cannot ignore it. Remember, the Harper Government is the government which came to power on a platform of being more transparent and ethical in government than their predecessors. Can Canadians really say that is what we have experienced? For the last several years, the Harper Government has been pushing through the bulk of its legislative agenda as part of the legislation associated with what we would traditionally call a "Budget Implementation Bill". (I would note that Harper doesn't call them "budgets" any more, preferring the more jingoistic moniker "Economic Action Plan" as part of his government's propaganda campaigns. By definition, an omnibus bill is one that affects multiple pieces of legislation when fully enacted. Most budget bills are a form of omnibus bill because they end up not only authorizing the overall expenditure of money by the government, but also make a myriad of adjustments to various laws related to the budget. For example, the 2007 budget implementation legislation changed multiple acts - the Income Tax Act, the Excise Tax Act, Tax Back Guarantee Act, and others. This is fairly typical. In the case of budget implementation bills, they usually do affect multiple pieces of legislation and it makes sense to deal with them as part of a larger whole rather than bombarding parliament with a ton of smaller bills which deal with the individual changes to each act. In 2009, the Harper Government introduced the term "Economic Action Plan" as a subtitle for their budget that year. This is something of a turning point in Harper's approach to the entire process of parliamentary budgets and how they are communicated to Canadians. The moniker of "Economic Action Plan" was used to label the projects associated with the economic downturn that had begun in 2008. Since then, even though the spending related to economic stimulus is long since expired, Harper has continued to use the "Economic Action Plan" moniker as part of the ongoing propaganda campaign that he has been running to prop up his government. The 2012 Budget Implementation legislation ( Bill C-38 ) took the concept of "omnibus" legislation to a new level, containing far more than legislation required to implement a budget, and instead making massive changes to implement more of Harper's policy agenda. Division 1 of Part 3 enacts the Canadian Environmental Assessment Act, 2012, which establishes a new federal environmental assessment regime. Assessments are conducted in relation to projects, designated by regulations or by the Minister of the Environment, to determine whether they are likely to cause significant adverse environmental effects that fall within the legislative authority of Parliament, or that are directly linked or necessarily incidental to a federal authority’s exercise of a power or performance of a duty or function that is required for the carrying out of the project. Division 2 of Part 3 amends the National Energy Board Act to allow the Governor in Council to make the decision about the issuance of certificates for major pipelines. This is part of a change of direction that places a great deal of power in the hands of the Cabinet, and in particular the Privy Council ultimately. Harper has spent millions of dollars on his propaganda campaign to convince us that the "economic action plan" is a "good thing". In 2005-06, Ottawa spent $41.3 million on advertising, a number the government has roughly doubled in every year since Stephen Harper took office in January 2006. The Conservatives — who rode to power in part due to the Liberal sponsorship scandal and government advertising corruption — spent more than half a billion dollars, $548.6 million, on advertising through their first six years in office. In 2010-11, Ottawa’s ad budget was $83.3 million, including almost $23 million on the Economic Action Plan. That was well down from 2009-10, when $136.3-million in total advertising included $53.2 million on the action plan. Think about it. While the government needs to communicate with the public, a steady doubling of expenditure is hardly a prudent use of taxpayer dollars, especially from a party which continues to insist that it is "a sound financial manager" for Canadians. Clearly, this is no longer about informing the public. It is part of a planned propaganda campaign designed to keep Harper in power. There are really two things going on in parallel here. The first is the use of omnibus legislation in Parliament to overwhelm the legislative process and ensure that policy based on ideology is not adequately discussed in the House of Commons. Everything that is said in the House is recorded in the Hansard and there is a clear written record of what every member has said. When the legislation is so massive that it cannot be effectively analyzed, much less debated in the time limited fashion that Harper has brought in by invoking time limits on debate for his larger bills, it makes it far easier to ram through legislation which would otherwise be stopped by the howls of public protest even if the governing party has a majority. (as happened with Vic Toews' "spy on everybody" act a year or so ago, which was allowed to quietly die on the backburner after citizens raised a fuss over it) Along with other tactics such as the "manual on how to disrupt parliament" from 2006, we need to recognize that Harper is attacking the very underpinnings of our democratic institutions. The second part of things is a propaganda campaign the likes of which Canadians have never experienced before. Harper has reached into the toolkit used by just about every authoritarian or totalitarian regime in the last hundred years or so and pulled out the classic propaganda tools. He is spending millions of taxpayer dollars not to inform Canadians of what the government is doing, but rather to misinform and misdirect us. Although the EAP ads may not be overtly partisan, there is a myriad of subtle ways that it is. The choice of colours for example, closely reflects the governing party's logo colours, carefully chosen wording, and the use of phrases like "The Harper Government" on press releases from Government Agencies are all means of reinforcing the association between these ads, government programs and the political party led by Harper. In short, Canadian taxpayers are paying for Conservative party advertising. These aren't campaign ads per se, but rather part of the ongoing "always in campaign mode" approach to governing that Harper adopted from the Bush II era Republicans. We should bear in mind that Harper is unique in Canadian history. Never before have we had a person in the PMO who is so strongly authoritarian in his approach to governance. It is more important now than ever before to carefully evaluate everything that we see from this government and its allies and ensure that we corroborate from multiple sources. A confidential report obtained by CTV’s Ottawa Bureau Chief Robert Fife shows the original version of Duffy’s audit found that the senator broke the Senate’s “very clear” and “unambiguous” residency rules. The report found that Duffy stayed in his Prince Edward Island cottage mostly during the summer months. He had listed it as his primary residence, which allowed him to claim an annual housing allowance given to senators who live more than 100 kilometres from Ottawa. Duffy’s air travel pattern also showed he lived in Ottawa and he had registered his address in the capital “for several official purposes,” according to the original report. The report also reveals that Duffy’s lawyers sought to have him exempted from the forensic audit. Additionally, Harper-appointed Senator Pamela Wallin has chosen to sit as an independent in the Senate for the time being while her own expense claims are audited. While Wallin's situation is different from Duffy's, it still looks as though she spent an enormous amount of time and money travelling. This may or may not be necessary travel, I don't know - I will wait for the auditor's report before deciding whether Wallin has abused her privileges. What I think we need to pay more attention to is the PMO and its denizens' actions in this whole mess. On Friday, Harper’s former deputy chief of staff Keith Beardsley said Wright made a major mistake that will likely continue to dog the Conservative government for some time to come. As well, Eddie Goldenberg, former chief of staff to then-Liberal prime minister Jean Chretien, said Wright was “dead wrong” to cut Duffy a $90,000 cheque. The Harper government was in full damage-control mode Friday, a day after Sen. Mike Duffy resigned from the Conservative caucus following new allegations he was claiming Senate expenses while campaigning for the Conservative party during the 2011 federal election. The prime minister, however, continues to stand by Wright, whose decision to give a $90,000 cheque to Duffy to cover improper Senate expense claims, is under review by the ethics commissioner. I don't think I need to express further outrage at Duffy's hypocrisy. Frankly it's out there for everybody to see, and Canadians should be outraged. Not just with Duffy, but with the people at the top. Even if the actions of Nigel Wright are deemed to be "ethically acceptable" by Parliament's Ethics Commissioner, they remain actions clearly designed to sweep the whole issue under the carpet. Canadians should be asking themselves why the PMO is suddenly involving itself in paying off a Senator's debts? Under Harper, the PMO has become something of a politburo - spending enormous amounts of money "managing the message", from centralizing government communications to actively spying on the utterances of MPs, both government and opposition. The amount of power and control being exercised from this office since Harper came to power is truly disturbing. That the members of his "personal office" believe that they are able to intervene directly in such a matter speaks to a sense of not just entitlement but invulnerability from scrutiny. The story swirling around Mike Duffy changes faster than the Tory spin machine can keep up with. A few days ago, Duffy had allegedly repaid the $90K in ineligible expenses. Then yesterday it comes out that he hadn't actually repaid them himself, but rather someone in the PMO had handed Duffy a cheque for $90K. But, let's dial back a ways to the beginning of this story, shall we? Back in February, auditors were asked to investigate the residency claims of several senators, including Mike Duffy. “As a Prince Edward Islander, born and bred, I am proud to represent my province and its interests in the Senate of Canada,” Duffy said in the statement. Amusingly, a few days later, we learn that neighbors near Duffy's alleged "primary residence" on PEI hadn't seen him there very often at all. Which, of course, raises questions as to whether or not Duffy is even eligible to sit as a Senator for PEI at all. In march, Duffy promised to pay the expenses back. In itself, that seems to be the honourable and appropriate thing to do. During April, Duffy claimed he was going to do nothing until the results of the audit were in only to turn around a day later and claim that he had already paid the amount outstanding back. The Conservative politburo in the PMO has lost control of this story - it has spun so far out of control that they cannot bury it. The most recent twist of a "gift" of $90K to Duffy from a high level PMO staffer just smells wrong. Not necessarily strictly wrong, but morally and ethically suspect. To claim that Harper didn't know about it seems less than believable, especially given Harper's known track record as a micromanager. Paying the money back smacks of a cover-up (which it is), and the longer this goes on, the worse it looks for both Duffy and the credibility of the Harper government. One might be tempted to look upon this as simply an individual Senator overreaching their privileges. That is certainly easy enough to do, after all Duffy is but a singular senator, and one who comes from a background of considerable privilege both in his personal life and as a reporter on Parliament Hill before he became a Senator. Then we have the revelation that he was claiming significant expenses on his Senate expense account whilst campaigning during the 2011 election campaign. — On April 5, Duffy spoke to the Kootenay-Columbia Conservative association in British Columbia. His travel claims indicated he was on Senate business. — On April 8, candidate Sandy Lee tweeted that she was meeting Duffy in Norman Wells, N.W.T. Lee's campaign paid Duffy $209.01 in expenses. His travel claims indicated he was on Senate business. — On April 21, Duffy was reportedly campaigning with candidate Scott Armstrong in Nova Scotia. Armstrong's campaign paid Duffy $409.91 in expenses. — On April 28, Duffy appeared to have a busy day in the Toronto area, campaigning with candidates Maureen Harquail, Wladyslaw Lizon and Gin Siow. Lizon's campaign paid Duffy $169.45, as did Siow. His travel claims indicated he was on Senate business. — On April 29, former cabinet minister Lawrence Cannon tweeted a picture of Duffy at an event outside of Ottawa that same day. The Deloitte audit listed Duffy as being in Ottawa on Senate business and claiming a per diem. If Duffy collected daily Senate expenses while on the Conservative campaign trail, taxpayer may have paid twice: Conservative candidates who paid for Duffy's hotel stays would have received federal rebate money for those expenses. Duffy's campaign events did not end there. On at least five other occasions documented in media reports, Duffy campaigned with Conservative candidates. He did not tell Deloitte about his campaign calendar, forcing Deloitte to list his activities as "undocumented." In essence, taxpayers were paying for Duffy to travel around Canada campaigning for the Conservative party. The first thing that comes to mind is that ALL Senators expense claims during the election campaign need to be reviewed. If it is in fact a "normal practice" for Senators to claim travel expenses while on the campaign trail, that needs to stop. Now. An election campaign is not in any meaningful sense of the word "Senate Business". However, this is but one thread in a much larger tapestry of Conservative dirty tricks during the 2011 election campaign. Consider, for example the infamous Robocalls Scandal where Conservative telephone calls to constituency residents were used to direct voters to non-existent voting stations. As if that were not enough, we also have Peter Penashue's resignation as a result of irregularities in campaign spending. While there is no excusing Duffy's actions, he is in some ways the proverbial "canary in the coal mine". He has been just naive enough that he has been caught out in a web of lies, deceit while his hand was firmly in the cookie jar. Politics is a dirty sport at the best of times, and few if any politicians can claim to be entirely clean. However, under Harper, things have sunk to levels far below those which Mulroney's government sank to in the late 1980s. This is blatant corruption and pork-barrel politics at its worst. While the events around the Airbus Affair certainly did not pass the smell test, they had a degree of ambiguity to them. What we are seeing today is much more blatant in the degree and extent of the corruption and abuse of Canada's system of governance. At the rate that he is going, Harper's legacy to Canadians will at its best be the redemption of Brian Mulroney. 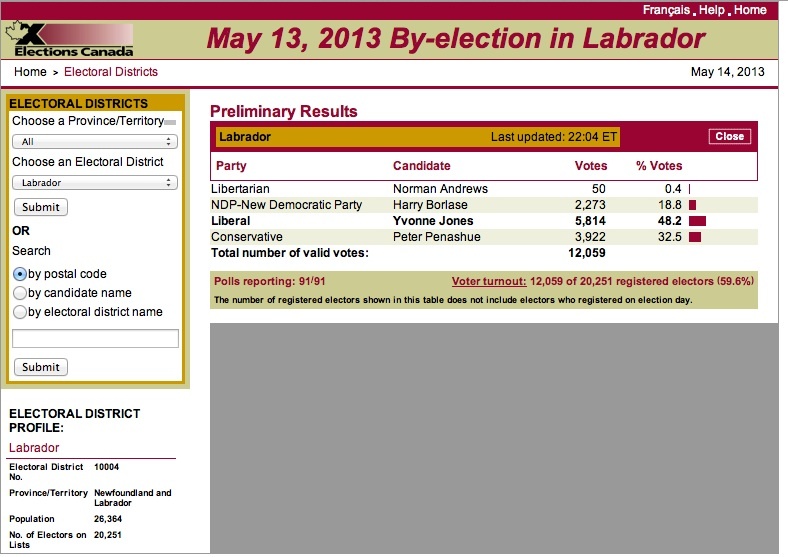 It comes as little surprise to me that Penashue was unable to regain his seat in Labrador. Frankly, the biggest surprise was the number of votes that he was able to garner. In my opinion, someone who stepped down for cheating on the last campaign should gather exactly zero votes. What is surprising is the collapse of the Liberal support during this by-election. When this by-election was called the Liberals had a 43-point lead in the polls. 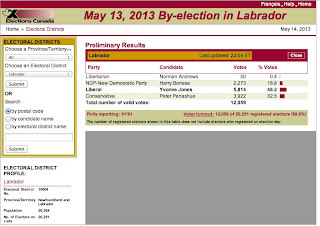 Since electing Justin Trudeau as leader and having him personally campaign there, they have dropped 20 points in Labrador. That’s a significant drop in only a few weeks. Labradorians were able to see firsthand how Justin Trudeau is in over his head. Objectively, this claim is utter nonsense. Frankly, this is typical of the Karl Rove-inspired politics that Harper has been importing into Canada. It boils down to taking anything that happens and trying to spin it into an attack on your adversaries. The attempt to use it as an attack on Justin Trudeau smacks more of desperation to me. What we really see in these numbers is a collapse in the voter turnout in 2008, with it dropping to 38.6%, followed by a gradual recovery to 59.55% turnout in yesterday's byelection. Penashue barely won in the 2011 election, winning on a margin of less than 100 ballots. Hardly a ringing endorsement of support for Penashue in the first place. Yvonne Jones took the riding in the by-election with a 5,814 votes - slightly more than the 5,426 votes Todd Russell won with in 2008. In comparison, Penashue took the riding in 2011 with 4,256 votes and went down to defeat with 3,922 votes last night. Practically speaking, this sounds to me more like a greater level of voter engagement took place, and a lot of people who sat on their thumbs in either 2008 or 2011 came out and voted. Given that this by-election was already underway when Justin Trudeau became the Liberal leader, and the lavish promises made on Penashue's behalf by the Conservatives during the latter half of the campaign, it seems to me that the Conservatives are reaching pretty far to try and spin this as some kind of voter comment on Justin Trudeau as Liberal leader. In fact, since this is the first time that the Harper Conservatives have lost a seat on a by-election, I would say that it seems to me much more of a condemnation of the Conservative party which keeps on playing by its own arbitrary rulebook.